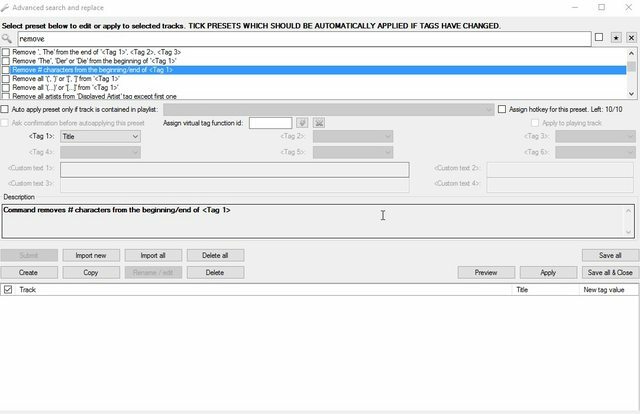 Has the formula for converting ReplayGain to Soundcheck changed? It used to produce something like this "00000943 00000943 00001728 00001728 00024CA8 00024CA8 00007AAD 00007AAD 00024CA8 00024CA8" but now it explicitly writes out what the changes are (like ReplayGain does). FYI, I fixed this. Turns out I was missing a few presets from AppData but not from the main plugin folder. Copying them all over fixed it. No idea how it happened. Bold words in my posts are links unless expressly stated otherwise. Have fun with them! If you copy any date time tag to last played, it doesn't write a correct hour. Can you take a look? The context menu for the plugin often disappears when using from the expanded panel of album covers view. If switching to another view, the menu shows up again. Boroda74 hasn't been on the forum since August, but I'm hoping someone can help me with this. Using the AS&R preset "Remove # characters from the beginning/end of <Tag 1>" I'm trying to remove 5 characters from the end of the track title. I use the drop-down to select 'Title' for Tag 1, but I don't see where there's a field to specify 5 characters. Nor do I see where to specify to remove from the end of the title. That preset literally removes "#" characters from both beginning and end of a tag. Use "Remove given number of characters from beginning/end of <Tag 1>" preset instead. Enter "0" and "5" in both custom boxes for your purpose. Ahhh ... The preset I was using removes the -number- sign (#) not a -number- of characters. I like to convert ReplayGain values to Itunes soundcheck for legacy purposes. I had that working nicely with this plugin, then had a hard drive failure. I saw it earlier in this thread, and wonder if it's because I'm using the "app" versus the standard Win10 installer. Please advise. Yeah I had this problem. What I did to fix it was delete everything under MusicBee>Plugins>ASR Presets and copy everything from MusicBee>AppData>ASR Presets in instead. I already have set up presets to auto Love tracks with ratings of 3.5, 4, 4.5 or 5 so I'm trying to make sure the inverse is true. This allows me to build out smart playlists of music I like based on cloud ratings as I tend to just love a song on last fm and use that as the rating. @all, I don't have access to my home pc now, will check all bug/issue reports during month or two. 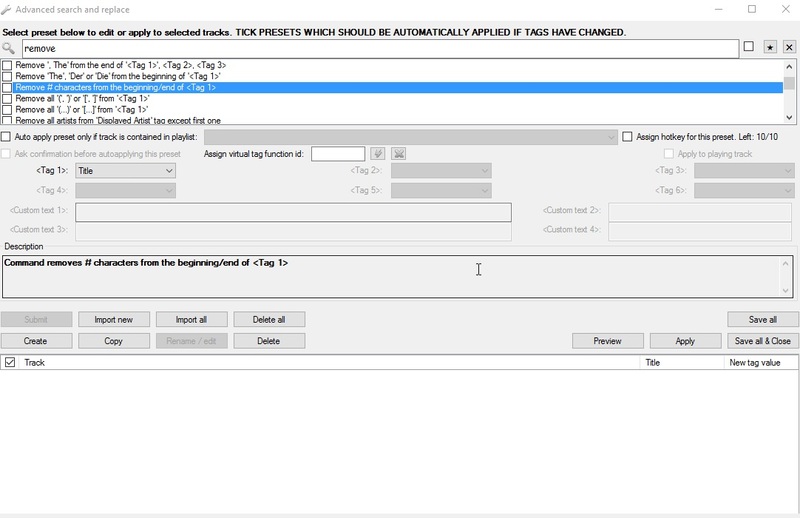 Is there any way to allow an exception to a ticked preset in AS&R? For example, I have both "Remove the track number from Track title" and "Remove the track number followed by a dash or dot from Track Title" ticked. This has been immensely helpful until today when I added a track with the title of "25 or 6 to 4" and it kept showing up with the title tag of "or 6 to 4". I see why it's happening, but it would be nice if I could exceptions on a per track basis. For the time being I've had to untick both presets. hmm. will be sufficient to have user defined exception value (or maybe value list) for track title (for any input tag in general) in this case? Yes, I think a list for exceptions would be better than one value. What I found odd while digging into this later was that I have about 150 tracks that begin with numbers and it was only this one track that had this behavior. I don't understand why (or how) the auto-preset would only affect one but not the others. @phred, enter tag exclusions separated by ;; in the list at the bottom of asr. if somebody wants to tick 'copy tag' preset for auto-applying, but so that it wont copy empty values, just enter ;; in the exception list. Thanks boroda. I'll have some time to dig into this in the next few days. And can you please make the window location persistent when you have the change? Thanks.